You have probably heard that a tax return can be changed (amended) if there is a benefit to do so. Many taxpayers believe, however, that this could raise a red flag with the Internal Revenue Service (IRS). And, of course, no one wants to get on their bad side. In this article, we will discuss how to safely amend a tax return. To correct a previously filed tax return. To make certain tax elections that are way beyond the scope of this article as they pertain to very few taxpayers. To change amounts, except penalties and interest, that have been already adjusted by the IRS. To make a claim for a carryback due to a loss or unused credit. 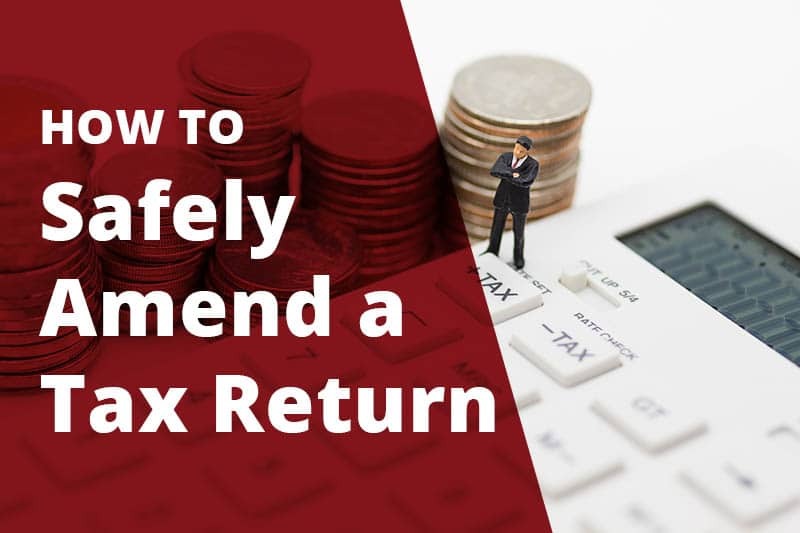 Certain tax benefits incurred in the current tax year may not be allowed by the IRS but can be carried back to a prior year (or carried forward to a future year which does not require amending a return) when the benefit may have qualified. The most common carryback is due to a net operating loss for the current year that can be offset against income in a prior year to reduce that year’s tax liability. Needless to say, by far the most common reason to amend a return is item (1) above. Beyond that, simply filling out a Form 1040X for an individual tax return (corporations and partnerships have their own forms—we will stick to individual for purposes of this discussion) and preparing the appropriate forms of the original return for the changes being made and mailing them (along with a copy of the original return as previously filed) is all that is required. Form 1040X does require an explanation of the reason for the amended return, but as long as it falls under the categories listed above, it should be quite safe and acceptable. A taxpayer owns a small business in which they use a vehicle 100% for business purposes. The previous tax preparer chose to take this deduction as an employee business expense that is reported as an itemized deduction on the taxpayer’s Form 1040 Schedule A. This is legal and is technically not an error. It is also probably not the most advantageous way to deduct this vehicle. The taxpayer reports their business income and expenses on Form 1040 Schedule C. Because of this, they are subject to income tax on the profit of the business and an additional (approximately) 15% self-employment tax on that profit. The new accountant looks at this same scenario for the next year and determines that the best (and legal) way to deduct this vehicle is as a business deduction on Schedule C. The benefit is not so much in the total income tax but in the savings on the self-employment tax. Reporting it on Schedule A does not reduce the income taxed as self-employment income, reporting it on Schedule C does. Since it was good enough to treat it that way this year, it’s good enough for last year since it is the same transaction. By amending the prior year tax return for this change, the new accountant was able to get the taxpayer a refund of approximately $2,500.00 at a cost of $150.00 to amend the return (by the way, the cost was offset by the interest the IRS had to pay back to the taxpayer for the use of their funds since the prior return was filed). Is Amending a Tax Return Safe and Legal? Amending a return in and of itself does not normally raise a red flag with the IRS. The nature of the transaction might. The transaction referred to above is one that is incurred in the normal course of running a trade or business. In either year, it might come under scrutiny because automobile deductions tend to draw a little more attention. As long as the taxpayer has properly documented the business usage of the vehicle in both years it is a perfectly legitimate deduction and this treatment is both safe and legal. On the other hand, if a taxpayer wants to amend a return for unreasonable, frivolous, or fraudulent reasons, then this would not be the case and any competent professional such as a Certified Public Accountant or Enrolled Agent would and should decline to do so. A taxpayer gets a notice from the IRS saying that a Form 1099 was received by them but the amount of income shown on it was not included on the tax return that was filed for that year. This is a common occurrence. As a result, the IRS assessed late payment penalties and interest of about $1,800.00. The taxpayer had forgotten to give their copy of the document to the tax preparer. The new accountant noticed that the same problem existed in the next year but the IRS had not found it yet, even though the return had already been filed (don’t worry they will). The new accountant also noticed that the missing income was not taxable in either year, but it is not the IRS’s responsibility to recognize this. It is the responsibility of the taxpayer. As a result, the new accountant was able to amend both returns and included the missing information, showing that it was non-taxable in both cases. This corrected the information the IRS was missing and saved the taxpayer the $1,800.00 from the tax notice and avoided the same problem happening in the following year. When Can a Tax Return Be Amended? There is a time limit on amending a return. In general, if you are trying to get a refund or take a credit, you have until three years (including extensions) after the initial return was filed or within two years of when the actual tax was paid, whichever is later. Having a Certified Public Accountant or Enrolled Agent look over a previously filed tax return can sometimes result in a tax savings, as we have seen. Look for a professional who is knowledgeable and aggressive in tax matters but who will not cross the line. And should a question arise with the IRS due to amending a return, make sure that the professional is authorized to represent you before the IRS (never do that yourself). The IRS only recognizes Certified Public Accountants, Enrolled Agents, or Attorneys—all of whom must have a Form 2848, Power of Attorney, and Declaration of Representative signed by the taxpayer—to do this.